“Parties recognize the importance of averting, minimizing and addressing loss and damage associated with the adverse effects of climate change, including extreme weather events and slow onset events, and the role of sustainable development in reducing the risk of loss and damage,” states Article 8.1 of the historic new Paris Agreement on Climate Change which was ratified at COP21, under the United Nations Convention on Climate Change (UNFCCC). The Paris Agreement aims to scale up global efforts to minimize loss and damage for countries facing climatic stress and poses the critical question: loss and damage of what? While there are tremendous economic losses due to climatic stress which need to be compensated financially, there are also losses that money cannot buy back, such as loss of identity, place, health, cultural heritage or biodiversity. What is Non-Economic Loss and Damage (NELD)? Non-Economic Loss and Damage refers to the adverse consequences (avoidable, non-avoidable or non-adaptable) of climatic stress, on items that are not traded in markets. NELD can be interrelated to economic loss and damage, meaning that some losses and damages can be both economic and non-economic at the same time. One such example is the loss of livelihoods as there is usually an economic loss related to losing a livelihood, but the impact can also be non-economic. In other words, the loss might be deeper than an economic one or cannot only be measured in financial terms. In September 2015, UNU-EHS, Munich Re-Foundation (MRF) and International Centre for Climate Change and Development (ICCCAD) organized the third Resilience Academy (RA2015) in the Dhaka area of Bangladesh. The participants joined a field excursion to a riverbank eroded and flood affected community named Singpur which is located in Kishoreganj district, about 100km from Dhaka. Singpur was selected as one of seven study sites in 2013, for the Gibika research to action project, to better understand what impacts environmental stress have on livelihood resilience in Bangladesh. The participants interviewed villagers about their experiences with climatic shocks and stress. 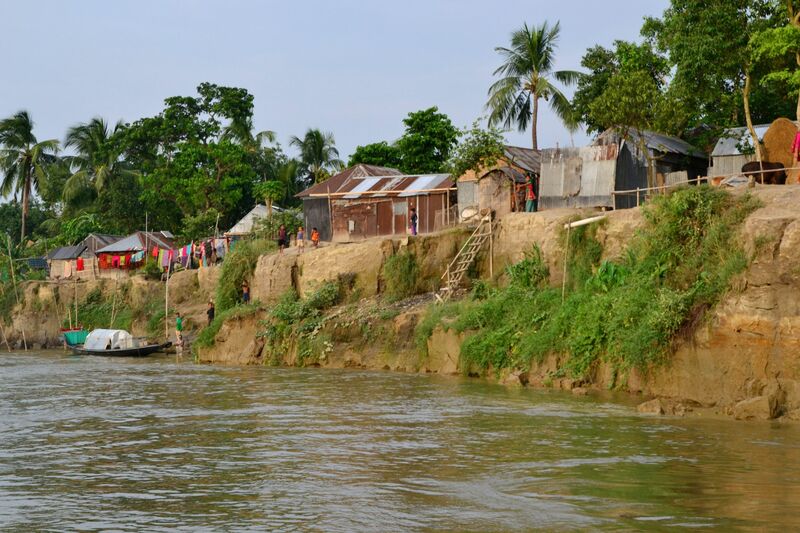 Every year, about a hundred houses out of the 1500 homes are destroyed by riverbank erosion, which means that the already densely populated village of about 15,000-20,000 people, is pushed together even closer. During the Gibika 2014 fieldwork, people in Singpur who have already lost three-four houses to the erosion were interviewed. People reported having been forced into seasonal migration, since they can no longer depend on livelihoods such as farming or fishing, but as a result of their deep attachment to their village, they preferred to work elsewhere just for a couple of months of the year rather than to leaving permanently. Why would people risk losing their home over and over again? Our research findings present similar situations and answers all over Bangladesh. People might have the financial means to leave, but they sometimes choose not to. Culture, traditions, social values, identity and emotional attachment to a place play an important role in the decision-making of going or staying. Most people do not want to leave a place where their families have lived for generations and where they grew up and have memories of. It is important to listen to people living in communities such as Singpur. Within the context of a climate agreement, whose objective is to protect the most vulnerable, it is also important to support those who want to stay. Personal narratives help reveal the reality for people living on the frontlines of climate change. They also help to paint a realistic picture for anyone who does not have the chance to visit places such as Singpur and to experience environmental stress first hand. Personal narratives help to identify gaps in existing policy frameworks to design people-centered policies and policies which will protect the most vulnerable. Policy-makers need to listen to the affected communities and learn from their narratives. The ones living on the front lines of climate change know best what support they need. In August 2015, the United Nations University Institute of Environment and Human Security co-hosted an expert workshop on non-economic loss and damage at the German Development Institute (Deutsches Institute für Entwicklungspolitik DIE). The associated NELD platform website contains some personal accounts of loss and damage from the frontlines of climate change, including some stories from the Resilience Academy field trip to Singpur. The Environmental Migration, Social Vulnerability and Adaptation (EMSVA) section, at UNU-EHS conducts essential research on non-economic loss and damage and has made important scientific contributions through initiatives such as the Loss and Damage in Vulnerable Countries Initiative (2012-2013), the Methods Toolbox for Assessing Loss and Damage (2014-2016) and the Special Issue on Emerging Perspectives of Loss and Damage (2015). These research findings have supported the development of the Warsaw International Mechanism (WIM) for Loss and Damage, which was established at Cop19 in 2013. The Executive Committee of the WIM are now meeting for the second time as the work-plan will be evaluated at COP22 later this year.